"Life is Beautiful" - Oil pastel and collage heart painting © 2012 Catherine Jo Morgan, #120003. In an earlier post on the Five Universal Shapes, I talked about the five shapes that carry nearly universal meaning, based on extensive research by Angeles Arrien. Her wonderful book, “Signs of Life: The Five Universal Shapes and How to Use Them,” includes full information on her Preferential Shapes Test. This test offers a unique way to gain insight into deeper levels of your own life journey right now. It’s a way to orient yourself — where you’ve been, what you’re working on now. I’ve used this tool for transformation many times and have never been disappointed. It’s especially helpful whenever I become aware that I’m entering a new phase of life. In my experience it takes only about fifteen minutes to complete the test and interpret it. Like a helpful dream, the interpretation continues to resonate and expand meaning in the ensuing days and weeks. The test itself is quite simple: from left to right on a piece of paper, draw the five symbols in your own order of preference. Position one at the far left is for the shape you like best, position two for the shape you like next best, and so on. Just go by gut feeling without trying to think about what the shapes mean. Be sure to put the five shapes in your own order of preference before you watch this video or read about how to interpret your choices. It only takes a minute or so to draw the shapes in the order you prefer right now. Just do it! 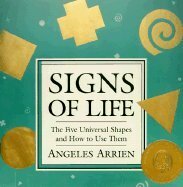 Article: "The Five Universal Shapes"
"Signs of Life: The Five Universal Shapes...."
I find Arrien’s book, “Signs of Life” still to be the very best resource on the Preferential Shapes Test. In the interest of full disclosure -- note that if you buy the book (or just shop at Amazon) by clicking on the cover image at left, you'll also be contributing a bit to my mission as a heart painter.